On Monday morning Mark and I got up early, showered, ate breakfast, and was packed and ready to go to Halong Bay. To lighten my bag a little more, I left behind one pair of black khaki pants, one dark colored t-shirt, and a pair of light sweat pants. We waited in the lobby of our hostel for a bus to pick us up. We were told it would come by any time between 8AM and 8:30AM. While we waited, Mark downloaded some podcasts to listen to during the 3 hour ride to Halong Bay. The minibus came at 8:35 and we loaded all of our stuff inside. Well, all our stuff minus Mark’s smartphone. It was forgotten on our breakfast table still downloading podcasts. There was no turning back. All we could do, as we sped towards the east coast of Vietnam, mostly on the correct side of the road, was to hope that someone put Mark’s phone in the Lost & Found and that it would be back at the hostel when we returned. 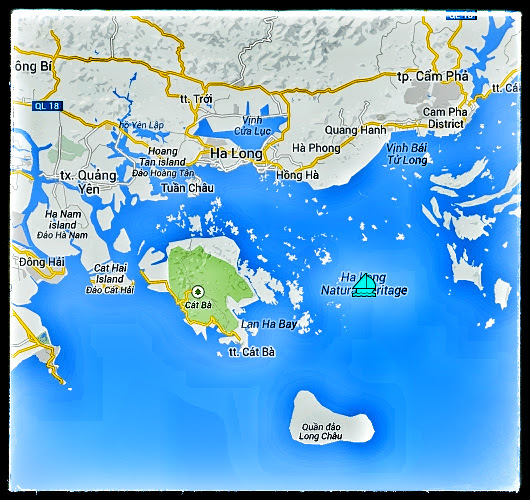 This would be my second visit to Halong Bay, so I thought that I would compare the two visits. 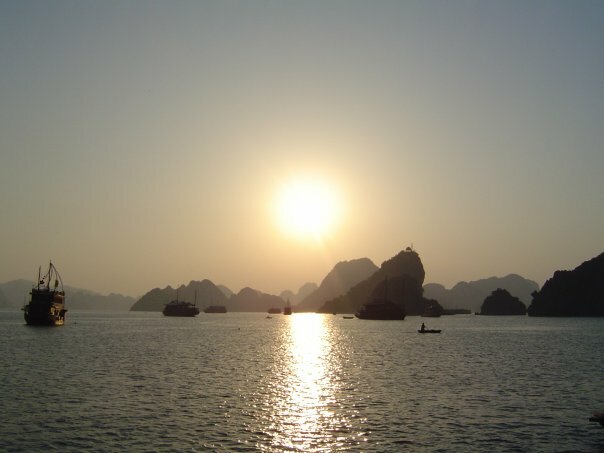 My first trip to Halong Bay was in May 2008. Then I had a 2 day, 1 night stay. I remember feeling like I wished I could stay longer. So, this time in 2017, Mark and I got a 3 day, 2 night stay with one night on the boat and the second night in a hotel on the island of Catba. Back then I paid 65USD for my trip; 32.50USD per day. This time Mark and I paid 145USD each; 48.40USD per day. So that just looks like normal inflation. The ride to Halong bay for both trips were pretty uneventful. Both were standard 3-hour drives with a 20 minute rest stop in the middle. On the 2008 trip the ride was in a van, but on the 2017 trip we were driven in a minibus. On both rides, it was best not to pay too much attention to how often the driver changed lanes, when he overtook someone, or how long he chose to stay on the wrong side of the road with on-coming traffic racing towards him before he hesitantly got back to the right side of the road while constantly honking the horn. The dock for the boats to Halong Bay was a bit more crowded during the later trip, though. There were many more buildings than before and a lot more boats. The wait time at the dock for the 2008 trip took about an hour. We were waiting for the 2 Dutch boys I talked about in the past entry. On the 2017 trip, there was no wait for us. Everyone who would be on our boat was either with us on the bus or already at the dock when we got there. Some people from our bus got on other boats. I don’t really remember all the people on my boat from back in 2008, so I have to go on the number of people in the group photo. Assuming no one was left out, there were 9 other people on the tour to Halong Bay with me. All these people were on the van from Hanoi minus the two Dutch boys. This number, as far as I can remember did not change. I mean, I don’t remember anyone leaving early or staying for more days on the boat. So there were 15 or maybe 19 people staying on the boat. In 2008 the boats looked more like modified traditional Chinese junks. They had junk sails they could put up, but weren’t needed because all the boats had modern engines. My 2008 boat could not sleep more than 10 or 12 tourists. In 2017, none of the boats looked like Chinese junks. These boats were bigger. Our boat could hold more than 19 people and it was one of the smaller boats in Halong Bay. Both boats from my 2008 and 2017 trips had 3 levels. There was a top deck for relaxing and mingling, a middle deck for dining, and the bottom deck for rooms. In 2017, there were many boats with 4 decks. For some reason our boat was not at the loading area along the dock. We had to get into a smaller boat, put on life vests, and be taken to where our boat was docked. Over the next few days, we would get quite used to taking all our stuff and moving from one boat to another. Once on the actual boat, we put our stuff in our various cabins then went to the second level of the boat. We were served lunch as the boat headed to Halong bay. It was a long and relaxing ride. I think it took about 1 or 2 hours from the dock to get to the bay. In Halong Bay there are these women who row around the boats. If you somewhat glance their way, they will row over to you and try to get you to buy things from their little boat. The last time I was in Halong Bay they sold dumb stuff. All they had were undelicious dry generic cookies, warm beer, fruit, and cheap sunglasses. This time around, they seemed to have gotten their stuff together. Their cans of beer were on ice. They sold Oreos, Pringles, the Vietnamese version of Pringles, sun screen, Snickers, wine, and lots of other stuff tourists would want to buy. I actually bought something from one of them, not because I felt sorry for her rowing around all day, but because she had something I genuinely wanted. After making her sale she stayed floating around my cabin door talking on her smartphone. My, how things have changed. Many of the rowers, in their downtime, were on their phones playing games or texting. I wondered what kind of coverage they got in the bay. The first stop in Halong Bay is at Surprise Cave. The cave hasn’t changed a bit. It’s still a lovely cave-like cave cram-packed with tourists who walk very slowly and take way too many pictures, me included… but mostly Mark. Mark and I and our tour group were given a whole hour to explore the Surprise Cave. This was way too much time. Mark and I followed the path through the cave and it led all the way down to where the ferries for the boats were docked. Along the way I stopped to take a photo of Mark. I guess the 3 seconds I needed to get the shot was too much for one lady because she bumped me and cursed at me as she walked by. She did the same thing to an older couple up ahead on their romantic stroll. Then we heard some shrieks further up the path which we assumed she had caused. But it was completely worth it because she was first in line to wait for her ferry which would not leave for another half hour. Some people just don’t know how to relax on vacay. On the 2017 trip our tour made a stop on Ti Top Island, named after some old Soviet guy who did something quite forgettable. Most on the tour group climb to the top of the island and took photos of Halong Bay, but Mark and I were having none of that. We wanted to relax. Seeing a beach, even a somewhat overcrowded one, we put on our swimsuits and jumped into the water. It was cold. Mark swam around much longer than I did. I stayed in the water only long enough to take a few photos. I tried to not look so cold, but I’m not that good of an actress. Back in 2008 I was not a big seafood eater. I grew up in the Virgin Islands where fish is a main stay. I did like some fish, but that was more the exception rather than the rule. But, on my first trip to Halong Bay I decided to give the seafood a try; after all the sea creatures came from right outside the boat. I tried shrimp with lime, salt, and pepper. It was amazing. I never knew that shrimp could be… delicious. Then I tried octopus, a meat I had only tolerated before. It was fresh and fantastic! “Give me some squid,” I demanded. It was tasty too. I left the bay a seafood lover. Returning to Halong Bay I told Mark that most of our food will be fresh seafood caught right from the bay. “There will be some chicken, beef, and pork, but the seafood is the specialty,” I enticed him. We were both looking forward to all the fresh calamari, fish, octopus, and shrimp dishes coming our way. But once aboard, we found that this was no longer true. The meals were mostly not seafood. It was mainly pork and beef from far away. The food was okay. Most meals started with a platter of French fries and then moved on to a random assortment of unrelated dishes. The meals were brought out one dish at a time and everyone served themselves like how one would eat at home with the family and a lot of “Could you please pass the fries?” As disappointing as it was, 90% of each meal was passable to delicious and only one meal I would out right call terrible. Later I read reviews of other tours. Most of travelers complained about the, “disturbing quantities of fish and seafood” being served on the boats. So, I guess the tour companies read those comments and responded by offering more French fries and imported beef. The trip to Halong Bay is a group tour, so you do what the group does when the group does it. There is no going off on your own or opting out of most things. This began to get on my nerves by the second day. My first time in Halong bay I stayed 2 days, one night. I remember leaving wishing I could stay longer. This time, I think I stayed too long. We were kept up late the first night to do some squid fishing. I guess this one, we could have opted out of by just going to bed. But, most of the group stood around waiting for something to happen like, seeing a squid in the water, but very few of us saw anything. I went to bed and later Mark caught a small squid which he handed over to the crew and never saw again. We were told to be up by 6 AM for Tai Chi and 7:30AM we would all have breakfast. No one made it to Tai Chi and many people had to be woken up for breakfast. We had a schedule to keep. After the meal, we had to pack up all our stuff and get off our boat and unto a ferry. We left our packs on the ferry and we made our first stop. By 9:00AM we were taken to a pearl farm, which is as interesting as it sounds. What it really is, is a floating jewelry shop with a short but boring tour at the beginning. Having no interest in buying expensive pearls, Mark and I just waited to be taken back to our boat. Once back on our boat, we were told to take our stuff and get on another boat. This boat took us to another boat, which took us to another boat, which took us to the edge of Halong bay. After spending most of the morning going from one boat to another we were finally where we could kayak. Before this past April 1st, tourists could kayak in Halong Bay. Now some law stops this. Online, several articles say the law is to prevent tourists from being scammed, but that makes no sense. If you want to prevent tourism scams, you should start with taxis or tour agents. By the time a tourist reaches Halong Bay, they have already been scammed. In fact, many Halong Bay tours are scams! Anyway, now the kayaking is done closer to Catba. Which means that only people doing the 2 night tour can kayak. After Kayaking we had the worst meal ever. “The best part of that lunch was the tofu,” is something you never want to hear your guests say for a non-vegetarian meal, but that’s what we all said. The food was pretty bad and most of it went uneaten. Then we were taken to Monkey Island, where monkeys rob tourists. The beach where we landed didn’t have anything to offer me; I would have much rather stayed on the boat. The main attraction on Monkey Island was a hiking trail; I was not interested. Then there was a somewhat swimmable beach; it was too cold to swim that day. So Mark and I bought some drinks and snacks and spent 30 minute shooing monkeys away. You have to stay on your guard with the Monkey Island monkeys. According to the many signs posted on the island, you should consider yourself lucky if a monkey only steals your Pringles. The monkeys have been known to run off with sunglasses, smartphones, cameras, and wallets. These primates aren’t messing around! They are cute and entertaining at first, but when you stop to think about all you have to lose, their boldness is less appealing. After Monkey Island we were taken to Catba Island. The great thing about the night on Catba was that it was a break from the tour group. We were left on our own with no one to keep us to a schedule. Our group had been broken up and added to other partially broken groups so many times throughout the day, that by Catba there were only 6 of us from our original tour group. In all there were about 12 tourists that left our boat to go to Catba, the rest spent the night on Monkey Island. I can only imagine the hell they went through. The 12 of us Catba tourists stayed in 4 different hotels. Mark and I and one of the pair of Dane stayed in the nicest of the 4 hotels. It was one of the biggest hotels in the island, though it felt empty and void of guests. Walking down the halls of this hotel reminded me a little of the hotels in North Korea. It’s big. It’s fancy. But without guests, how does it make money? It was a 3 star hotel, which sounds impressive. The hotel was not fancy, but it did have a lot of communist-cliched fancy-hotel kitch. In the lobby was a set of shiny wooden furniture. It looked expensive and extremely uncomfortable. There were way too many tables in the dining hall and they were all too small for the 4 adults they all seemed to be set for. The chairs in the dining hall all wore wedding dress like coverings that looked fancy yet made everything just look ridiculous. There are about 20 people staying here. We didn’t do much in Catba other that walk around a bit before returning to the hotel. We had dinner at the hotel, since all meals came with the Halong Bay Tour Package. Although there was no one else in the entire dining hall, they made us sit with the Danish couple for dinner. It was an awkward meal. I got the feeling that the Danish couple, though polite, didn’t want to talk to us. Maybe it was their lack of interesting conversation topics, or maybe it was their mostly speaking in Danish. We would have happily left them to their own thing if we weren’t force to sit with them on the tiny tables set out for us. The next day for breakfast I was shocked to see about 10 people in the dining hall. Up until that point I thought it was just Mark, me, and the Danish couple. I wondered if these people, like Mark and I, were placed in this hotel as part of a packaged tour, or if the hotel had an actual functioning marketing department. The next morning we were taken back to the boat. From that boat we were taken to another boat and given “cooking lessons”. By “cooking lessons” I mean we were shown “how to make” spring rolls. The tour package came with a cooking lesson. What actually happened was… We were given a plate with slices of vegetables and another with rice paper, along with a cup of water and one plastic glove. With a few verbal instructions we made some spring rolls. It was not a cooking lesson, but I was grateful for that. I didn’t want to actually cook on vacation; I’m on vacation. After that we were fed lunch and left alone until we got back to the dock where we would be placed on a bus back to Hanoi. We were finally left to rest having completed everything on the schedule. It was a peace 2 hour ride back to the dock. Don’t expect to relax too much on a Halong Bay trip. You might get scammed on your package tour. Ask other travelers how much they paid and what agency they used. 2 days, 1 night is best. When the food is not great, buy snacks from the rowing ladies. Squid fishing is not that fun. Look up what hotel stars mean before you buy your tour package. 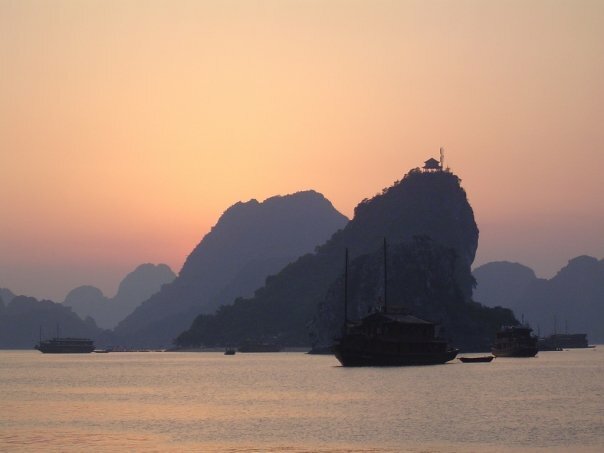 There are many companies that offer trips to Halong Bay from Hanoi and other cities in Vietnam. Just shop around and ask other tourists for their advice. Depends on the agency you use and the package you get. There is no more kayaking at Halong Bay. I’m not sure if his prices are lower than other package tour places, but his prices are posted on signs around the office. Also, when you ask him a question about costs, he can tell you right away. He didn’t have to call anyone on the phone first, unlike other package tour places. The costs of the tours are what you see posted on the walls plus 10% tax.